Locomotive taken from an unusual angle, which gives good view of the coach, tender and inside of the cab. There are some interesting signals and curious buildings on the right. What are they all? Where is it? When is it? 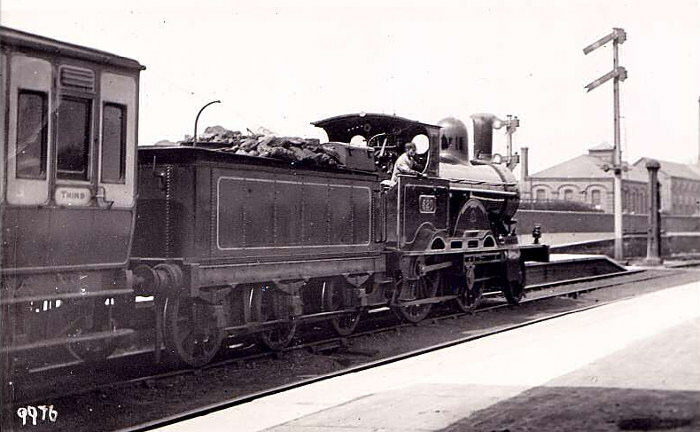 The engine is Webb Experiment class 520 'Express', the date somewhere around 1890, but where it was taken is difficult. The position of the sun and the layout, two main line tracks with a single track coming out of the far platform, suggest it might be the north end of Wigan. If so, the buildings visible were removed in the widening in the 1890s. The Ordnance plan surveyed in 1889-92 shows some small industrial buildings in this location, and though I'm not entirely convinced that it is Wigan, I can't think of anywhere more likely. This photograph was taken by P.W. Pilcher between his arrival in Shrewsbury in 1892 and September 1895 (when coal rails were fitted to tender). Taken at Whitchurch looking towards Crewe. The train is bound for Crewe and the subsidiary signals refer to the Chester bay, the horse dock can be seen in the back ground. The engine is Experiment class No 520 'Express' which was involved in the Chelford accident of 1894. Whitchurch - of course! And what a relief! If any further evidence is needed, the same (foundry) buildings can be seen in the 'Journal' Vol 3 No 1 p7, in Jack Walne's article.